Add to Accumulate – Now Back in Inventor 2018.2! With the release of 2018 we were treated to a new Measure tool (LOVE IT! ); however, the Accumulate functionality was not initially included. With the release of Inventor 2018.2 it has made its triumphant return. It is not super intuitive, so I wanted to take some time to explain how it works. Firstly, it can be used to add (accumulate) multiple linear, area, volume, and angular measurements. Each of these types of measurements will appear as separate entries in the Accumulate field. Once the initial measurement is made, hover over the value in the Measure dialog box and click as shown below. Once selected, the Accumulated Properties area is displayed at the top of the dialog box (as shown on the right) and the initial value is listed. Select a new entity in the graphics window to measure. The Measure dialog box updates listing its value as Selection 2. The Accumulated Properties area remains at the top of the dialog box. In the Selection 2 area, hover over the value and click as shown below to add the new value to the previous one. The value updates in the Accumulated Properties area as shown on the right. Continue to measure and add accumulated values as needed. To display the full list of the accumulated values, select the (History) icon. This toggles the history display. If the history display is off, only the total is shown. Otherwise, if on, each accumulated value is shown along with the total. In the second image above the History is displayed. To clear a single value in the accumulate history list, hover over it and select (Delete) to remove it from the total. To clear a total accumulated value, hover over it and select (Delete) to clear it. All in one Measure Tool! 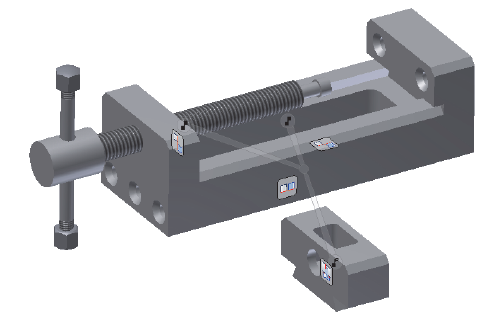 The workflow that was previously used in Autodesk Inventor to conduct measurements has been completely updated in 2018. Instead of multiple measure commands, there is now a single command that can be used to conduct many different types of measurements. The new command is located on either the Inspect or Tools tabs and is simply called Measure ( ). You can also access it in the Marking menu or when entering dimensional values during feature creation. It is easy to use and very intuitive. All possible results for your reference selection are displayed in the Measure browser. The references are assigned colors. The first selection is blue and the second is green. The expandable and optional Advanced Setting area can define the precision and whether to display the result in multiple unit formats. If you don’t want to modify these settings, you don’t have to even look at this area. The orange measurement value in the Measure browser is the value displayed on the model. To display a different value, simply select it in the browser. To restart a measurement, left-click in the graphics window. Quick and easy! The tool is the same whether you are conducting a measurement in a part or assembly; however, in an assembly you are provided with a series of selection filter options to make selection easier. Select an edge to measure its length and select a second edge to measure the distance between them, as shown below. Select a circular edge to measure its diameter, radius, length, and angle, as shown below. Select a point to measure its location (X, Y, and Z) relative to the active coordinate system, as shown below. Select a second point to measure the distance between them. Individual position values are also measured. The midpoints of entities can also be selected as measurement references. To measure an angular value, select linear references or faces as shown below. Alternatively, you can measure the angle created by three points by selecting the first two points, press and hold <Shift> and select the third point to define the angle. To measure the angular extent around a circular edge or arc, select it. Once a planar face is selected, the outside perimeter, the total loop perimeter (all edges that lie on the face), and the area of the face are displayed, as shown below. Once a cylindrical reference is selected, the radius, diameter, total loop perimeter (all edges that lie on the face), and the area of the face are reported, as shown below. 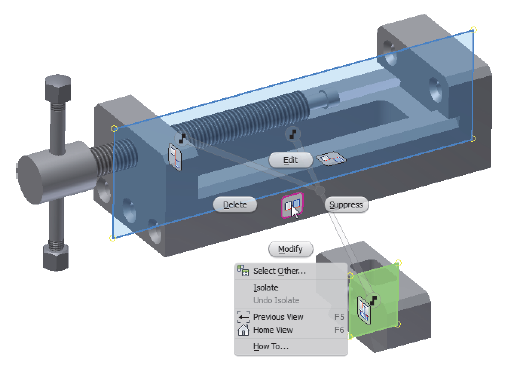 To measure the minimum distance between components, change the filter option to Part or Component priority and then select two components in the model. Among other reported values, the Measure browser displays the minimum distance between the components, as well as individual solid volume measurements for each component. I hope that this helps you become more familiar with using the new Measure tool in 2018! If you have any feedback please let me know. Good luck!